If you Join our Mailing List you will receive a weekly e-mail newsletter containing news, announcements, participants scheduled for Sunday, and a prayer list. is open for prayer and quiet during regular church office hours. 10:00 a.m. - 2:00 p.m., Monday thru Thursday. Sending money through trusted and experienced organizations is probably the best way for the individual to contribute to international disaster relief. Donations thru the Episcopal Relief and Development Fund is one such trusted way. Your Kroger Plus card can help the Church.
. . . seeking and serving Christ in all persons. Welcome! 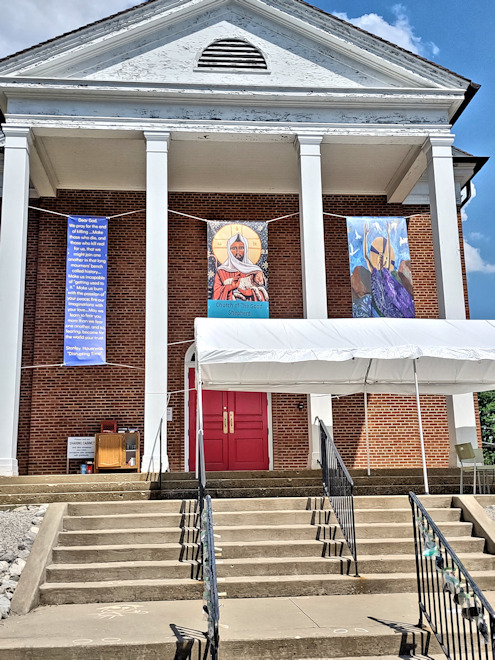 The Episcopal Church of the Good Shepherd in Athens, Ohio is a diverse, welcoming, growing parish congregation, located on the campus of Ohio University - - Seeking to know and serve Christ in loving service to the Campus, the Community, and the world. Choir Rehearsal, Sunday April 28, 9:30 a.m.
Group meets on Tuesday at 9:30 a.m.
May 28, home of Julie Nehls. Of all the beautiful opportunities the church has for us, there nothing quite like Holy Week. We know you are busy, we know there are many demands on your time and energy every day. Holy Week is not intended to be yet another list of “to-do’s” to add to an already long list. Instead, Holy Week is a pilgrimage: an opportunity to let go of some of those demands in order to spend time walking through Christ’s final days in ways that can be renewing so that you will be able to return to your demands renewed in spirit and purpose. Palm Sunday Sunday, April 14, 10:30 a.m. This service begins with a sense of excitement and enthusiasm as we bless palm branches and commemorate Jesus’ triumphant entry into Jerusalem, but quickly turns as we find ourselves listening to Christ’s Passion. Often we leave this day feeling uneasy. The gift of this day to ask ourselves the question of who is Jesus to us? And challenge ourselves to follow Jesus into places we may not want to go so that we can share in the tremendous joy of his Resurrection. Tenebrae Tuesday, April 16, 7:30 p.m.
A service of shadows. A touching liturgy heavily influenced by monastic prayer services that helps prepare our hearts, minds, and souls for the darkest time in the Church Year by emotionally recreating the betrayal, abandonment, and agony of Christ. A powerful worship service that can help us recognize God’s Light in our darkest hours. Maundy Thursday Thursday, April 18, 7:30 p.m. This service shows us what Love is; not only what the Love of God looks like, but to experience it first hand during the washing of feet. One opportunity for us is to see how strong this Love is, because the service does not end with Jesus and his disciples sharing a meal, it ends with the stripping of the altar and then bare and desolate silence. This silence may feel empty, however it may be full of too. Full of a Love that does not abandon us when things are challenging or lonely or frightening, but is Present in ways we might not recognize. Good Friday Saturday, April 20, 7:30 p.m. It might seem inappropriate to use the word “good” to describe the day we are invited to journey to the foot of the cross once again and be present to Christ’s suffering and death. It is a dark, disturbing day. But we need this day, because all the events that proceed and follow depend on this day, while some might choose to skip this part, Jesus was not able to skip it. His death and resurrection are intertwined, we cannot separate them. Today is a chance to recognize that when the world does its worst, that doesn’t mean God is absent, or doesn’t care, or has lost. Instead it invites us to wait and see what God will do. Great Vigil of Easter Sunday, April 21, 10:30 a.m.
Of all the worship experiences in the Church, there is nothing like the Great Vigil, which might be why it is called “great”. This service will dramatically bring into culmination the week’s holy journey. With the lighting of the First Fire, hearing our salvation story, the joyful return of the Alleluia we discover that somehow in the darkness Jesus who died did not stay dead. He rose; and that amazing truth will shatter the darkness of fear. The Great Vigil is one of (if not the) oldest and unchanged worship services in the church. It is a powerful service that cannot be rushed to or through, but must be entered into with an open heart, mind, and soul so as to help immerse us into the amazing gift of redemption and grace. Welcome to our Website! We are honored that you are visiting this site and hope that it will be a helpful way to learn more about this parish, our ministries, and our mission. Whoever you are, and wherever you find yourself in your life, I hope you felt called to visit us, and will find what you need here. The Episcopal Church of the Good Shepherd has a history of taking the words of the Bible seriously that say we are to: “Love the Lord your God with all your heart, with all your soul, with all your mind, and with all your strength and to love your neighbor as yourself.” It is our belief that these words, which are found in both the Old and New Testament, are the foundation of the way we are to live out our mission collectively and individually. We believe God loves us, and that every human being is created in God’s image. For us, that is really where it begins: and it means that we intentionally welcome all people regardless of gender, age, race, color, sexuality, socioeconomic status, marital status, politic, or physical condition. At the Episcopal Church of the Good Shepherd we not only want to welcome you, we want to invite you to join us in growing in faith and love of God, and to live out our mission of seeing Christ in all persons and serving all persons in Christ. We believe that only together we can do the work of Jesus in loving God and loving our neighbors. In our parish’s life, we have found living this mission to be at times challenging and exhilarating, joyful and fulfilling, and that there truly is a place for all of us. It is my prayer that you will find at the Episcopal Church of the Good Shepherd a safe place for spiritual exploration and healing, a place where you find our words of welcome are really more than words and will join us in living out God love. The Rev. Deborah Woolsey is the Rector for the Church Of The Good Shepherd. Check HERE for biographical information. WELCOME TO THE EPISICOPAL CHURCH OF THE GOOD SHEPHERD! Whoever you are and wherever you are on your journey of faith, we welcome you in the name of Jesus. FOR PASTORAL NEEDS please contact The Rev. Deborah Woolsey at 937-689-8895 (C) or 740-593-6877 (Church) or by e-mail at revdebwoolsey@gmail.com. TO FIND OUT MORE ABOUT GOOD SHEPHERD please contact David Burton, Senior Warden, at 740-593-5634 or by e-mail at drabeja02@yahoo.com or The Rev. Deborah Woolsey at 937-689-8895 or by e-mail at revdebwoolsey@gmail.com. THE MINISTERS OF THE CHURCH are the whole People of God. To inquire about various ways to participate, please speak to one of the clergy or staff. Please consult Ministries and Ways to Serve for more information on what we do. 10:00 a.m. - 2:00 p.m. Monday thru Thursday. If visiting, please browse the "Events Calendar" for scheduling details.